Thanks to the 114 people who responded to our recent online quilting/sewing survey. Based on your feedback, here's a sneak peek at just some of what we have planned for 2017. The top four class requests were machine applique, free-motion quilting, how to use color and choose fabrics, and bags/totes/organizers. We'll definitely offer these classes next year, along with many others. Stay tuned. A few people cited cost as a barrier to taking classes. We understand and wish we could offer them all for free. But alas, we have to keep the doors open, the lights on, the vendors paid, and so on. One thing we can and will do, starting in January, is offer First Saturday Make & Take classes. These will be quick projects that you can finish in about three hours, and the class fee will be just $10. Hopefully this will appeal to the budget-conscious and to those of you who work during the week. On the topic of class fees, keep in mind that we offer a Class Pass which allows you to take unlimited classes for three months for $69. That's another way to make classes more affordable. 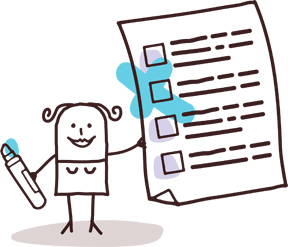 There was a great deal of interest expressed in the survey for Sunday classes and events. So staring in January look for more classes and open sewing sessions to be scheduled on Sunday afternoons. Many respondents took the time to answer several open-ended questions on the survey. We have read each and every comment and as our team analyzes the suggestions more fully we'll incorporate as many of them as possible into the 2017 class/event schedule. This wasn't in the survey, but we've decided to reserve our classroom on Mondays and Wednesdays for open sewing starting in January. We won't schedule classes* on those days so you'll know that you can always come and sew with your friends without having to check the schedule ahead of time. Hours for open sewing are 9:30 - 5:30*. There is no charge for this service. Next week we'll share the results of the yarn department survey we conducted alongside this one. Thanks so much for participating and helping us create a fun and educational 2017 for you. * Except on occasional Wednesdays when a Youth Class will take over at 3 p.m.
One more thing we have planned starting in January is this beautiful Block-of-the-Month. It's called Getting to Know Hue. 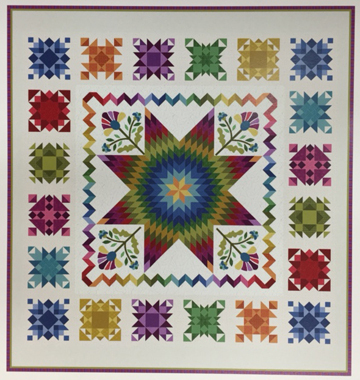 One of the nice features about this 96" x 102" quilt is that the four applique blocks are laser-cut and pre-fused making them quick and easy. Also, the pieced blocks have a background fabric border around them so that you trim blocks down to the perfect size (so no stressing if your finished block is a tiny bit off). 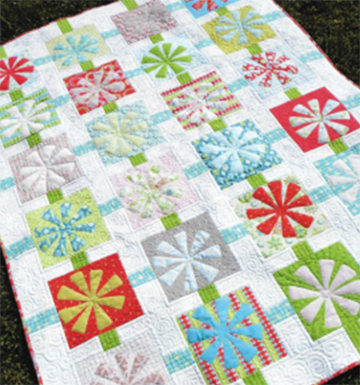 When it's time to make the lone star featured in the center of the quilt, we'll schedule a free class for everyone who is participating in the Block-of-the-Month. The pattern for this quilt is very well written. Karen and Judy are working on the sample now and we hope to have it hanging in the shop by mid-December. You can sign up for this program now if you'd like. The cost is $29.99 per month for 12 months. Block kits will be available on the 15th of each month starting in January. We're happy to ship monthly to our out-of-town customers. The fabric that arrived over the past week made us all smile. 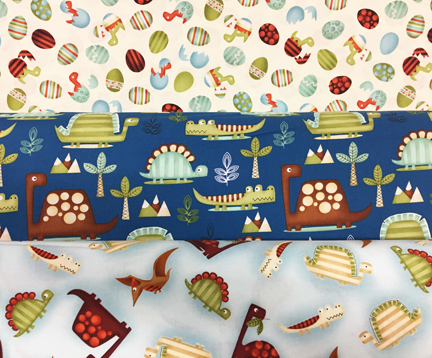 This cute dinosaur group would make a darling quilt for any little boy or girl. 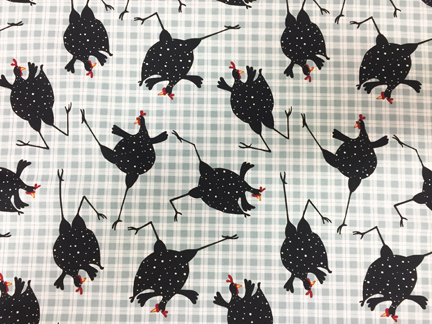 We're envisioning these dancing chickens as an apron. 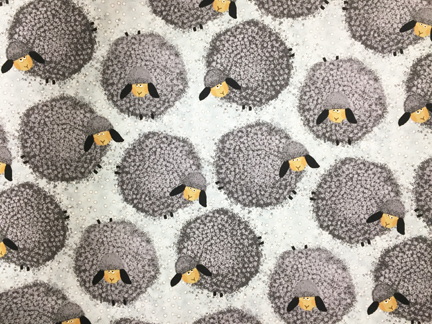 And these very fluffy sheep would make great tote bags for anyone you know who knits, crochets, or raises sheep. 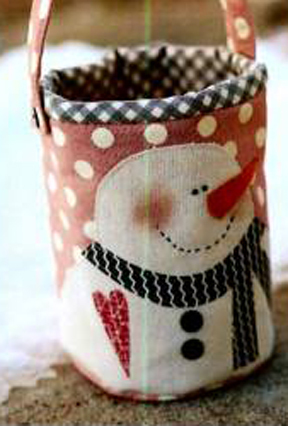 This adorable handle basket featuring Mr. Snowman measures 8″ tall and 5 1/2″ in diameter . . . perfect to hold holiday candy, Christmas cards, or even as a gift bag for someone special. Students will sew, applique, and sew on buttons to make this project. Aimee King will teach. In this two-session class you will learn to cast on, knit, purl, increase, decrease and bind off. Anne Worthington will be the instructor. A pair of knitting needles and ball of yarn are included in the class feel. Limited to four students; youth and adults welcome. 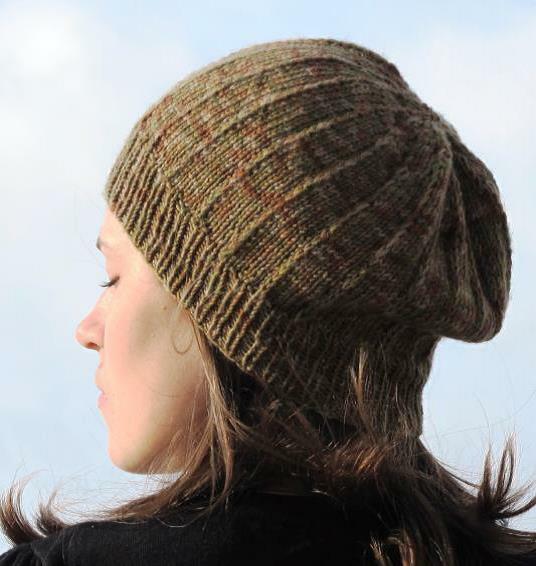 Learn to knit in the round using circular needles with this simple hat that is suitable for either solid colors or variegated yarn, including hand spun. Learn to modify this hat to become a more or less slouchy beanie. This class is for confident beginner and intermediate knitters (i.e., you must know how to cast on, knit, purl, increase, and decrease). 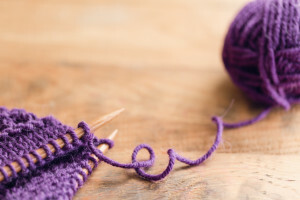 Click here to see all upcoming knit/crochet classes. Thursday, November 17, 12:30 p.m. Whether you love or loathe math, doing a bit of it from time to time is necessary if you quilt. In this brief (20 minute) session you'll learn easy ways to calculate fabric requirements for binding, borders, sashing, and backing. Bring a calculator. Thursday, November 17, 1:00 p.m. This interesting and growing group will meet again at Cortez Quilt Company on Thursday, November 17 at 1:00 p.m. If you attended the last event at Gail's house, bring your pounded flowers pieces along with any other Show & Tell you'd like to share. Stay to work on a project after the meeting if you'd like. The classroom is available until 5:30 p.m. Reminder: Entries for our Landscape Challenge are due on November 30. This annual event is right around the corner, so save the date. Come in the day after Thanksgiving (Friday) to fill out your Holiday Wish List to be entered to win a gift certificate. We'll also continue the popular CAD Card for next year, too. Spend $25 during our sane alternative to Black Friday and receive a punch card that's good for 12 yards of free fabric throughout 2017. We'll also have a few special deals running on this special day. Independent dyer Carolyn Greenwood from Genola, Utah will be here on December 2 & 3 to show her beautiful work and sell yarn and fiber. A trunk show and sale will be held on Friday, December 2 from 6-8 p.m. Light refreshments will be served. Please RSVP to 970-565-7541. Then on Saturday, December 3, Carolyn will teach two knitting workshops. From 10 a.m. - 12 noon learn how to make a mobius cowl. From 2 - 4 p.m. start on a pair of thrum mittens (knitted and lined with warm, fuzzy fiber). Each workshop will be $20 plus supplies. Homework: Cut fabric per pattern. Trace pattern for fused piece to fusible product (Steam a Seam 2 Lite or Heat n Bond Lite) but do not fuse to background squares. From now until mid-December (six weeks) we'll be sharing a Yarn of the Week to give you ideas for holiday gift items that you still have time to make. First up is Zauberball. This wool yarn has wonderfully long color runs that can be used for socks, scarves and a myriad of other colorful projects. We carry lace weight without nylon, sock weight with nylon, and now a DK weight yarn. Come in and see the broad range of colors, as well as selected patterns and finished samples that are sure to spark your holiday creativity.